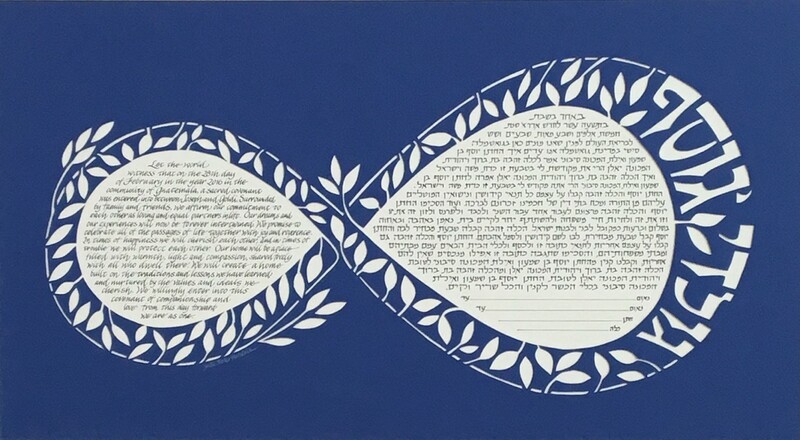 In the Fall of 2016, I was commissioned to create an original Ketubah for a young couple in Israel. The bride and groom asked me if I could design a paper cut Ketubah for their wedding. I had created many Ketubahs (illuminated marriage contracts), and had also created pieces of art in the style of a paper cut before. I had seen and admired many paper cuts, but had never actually created one myself. 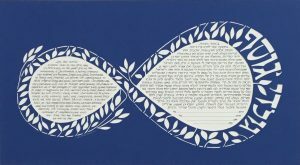 So I said, yes, of course I could design a paper cut Ketubah for them. Then I set out to learn how. 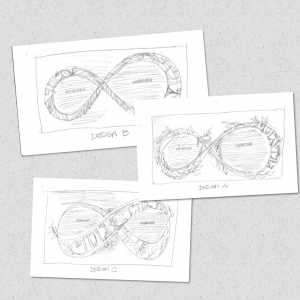 My design process was the same as for any Ketubah I had done for so many weddings in the past. I listened to what the couple wanted, and created several sketched ideas for them to look over and share their input. 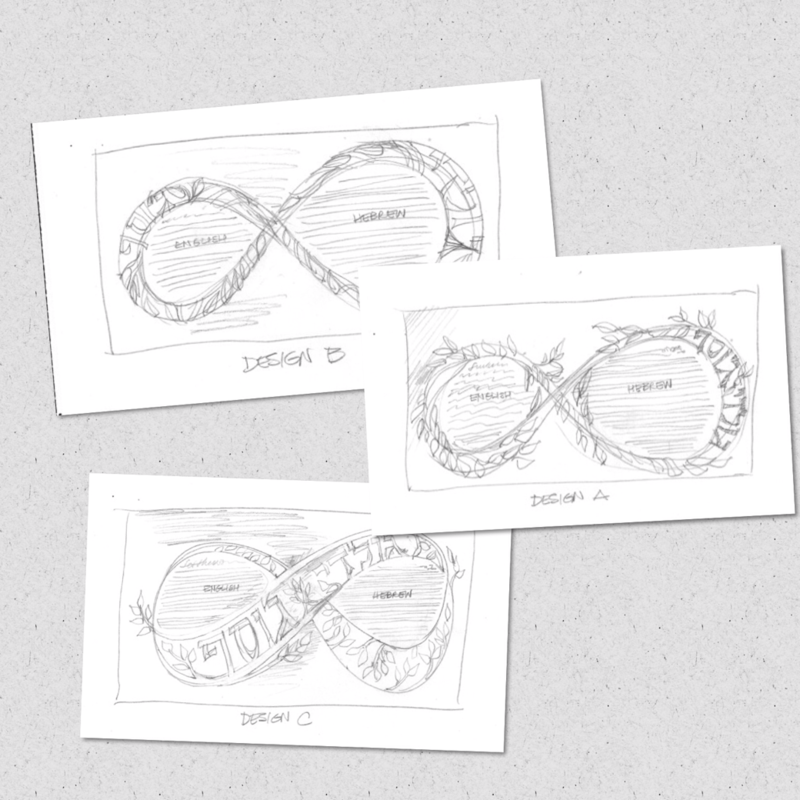 The main difference was that these sketches had to form a design that could work, being cut from a single sheet of paper. 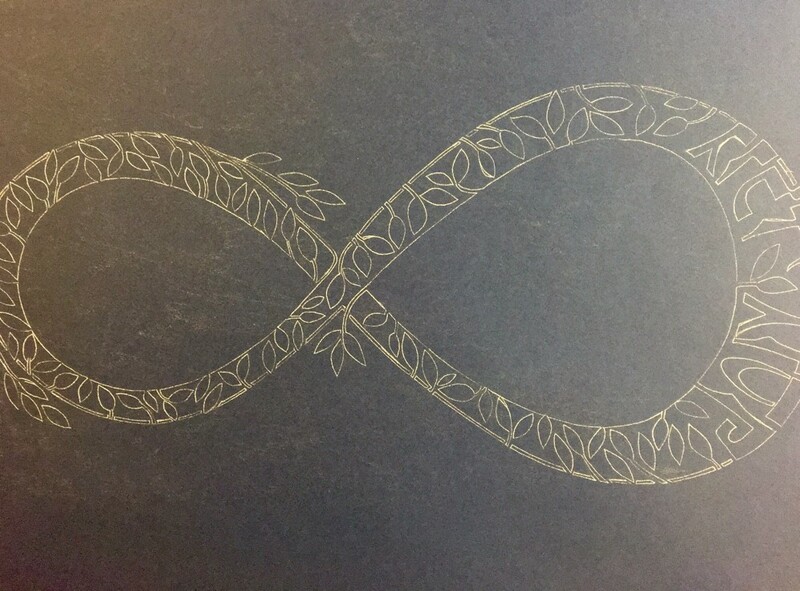 The bride, originally from Baltimore, and the groom, originally from Guatemala, wanted something based on the infinity symbol, and incorporating nature, and their English names in Hebrew lettering, with both a Hebrew and an English text expressing their vows. I sent them three sketch ideas and from their input I modified and tightened up the design they liked best, taking it to the next stage, and planned the color with them. My learning curve increased as I realized that if the design didn’t work as a stencil, keeping all parts of the image attached, the cut sections would “fall off” the final art. Finding the perfect paper color was next. I chose a wonderfully pebble textured paper, Mi-Tientes, in a rich blue, with which they happily agreed. I sized and laid out the Ketubah. The Hebrew and English texts were hand lettered onto a Crescent cold press illustration board, and then the paper cut work began. Using a white “carbon style” marking paper, I drew a reverse image of the art onto the back side of the paper to be cut. It’s a good thing I have a large supply of X-acto Knife Blades, as I needed to use a very sharp cutting blade and I went through quite a few to make sure I was never working with a dull knife. Cutting was careful, detailed work, requiring a steady hand. I quickly learned that there would be no Starbucks for me when doing paper cut work. Once the final art was fully cut out, I needed to be able to line it up exactly, and adhere it to the art board, perfectly positioned, surrounding the two sections of text. What glue would I use? What technique would best work to adhere the cut art to the board without buckling or yellowing over time? Thanks to the skilled and helpful artists working at my local Plaza Arts Store, I was guided to the proper materials and technique and although I was a bit nervous, it worked perfectly. The wedding ceremony and reception took place in February of 2016, in Guatemala, celebrated with family and friends. I wish Goldi and Joseph many wonderful years together, with an infinite amount of love between them, as the design of their original Ketubah so aptly expresses.